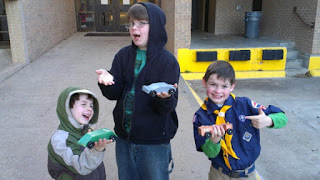 The other day I realized I had made a scheduling snafu: My Tuesday schedule: Christian Believer class, a wedding conference immediately before that, and Pastor JoAnne's Taize service all conflicted with Miles' first ever Pinewood Derby for Cub Scouts. 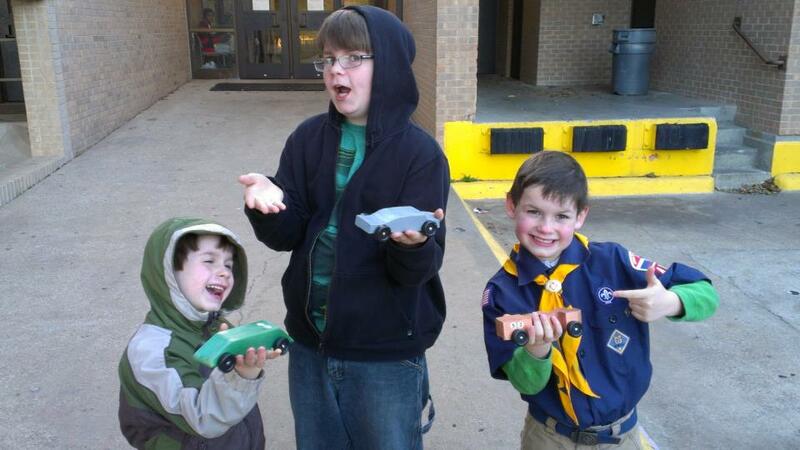 Just a couple of days before, all five of us spent an hour of so sanding and painting all three boys' cars for the derby. How could I have forgotten it? That morning I began working the phone, cancelling my appointment, telling JoAnne I could not be at worship, asking Sue Thorn to step in and lead class until I got there. It all worked out. Whew. We had a great time at the derby. Miles' car came in 2nd or 3rd (out of 4) in all of its races, and he won a trophy for "Most Funky Car." The racing was over at 7:25. Then I headed to church for Christian Believer. I was on time. And then: traffic. Not just traffic: TRAFFIC. It took 45 minutes to get to SMU from Royal. I began texting members of the class to say I would be later than I thought because of traffic. Sue wrote back: "Go home. We're fine." But I was determined. I kept going. Another 10 minutes to Knox, where the accident happened. From Byron, and Sue again: "Really. Go home." So I u-turned there at Knox. I arrived home at 8:45. More than an hour of my life was lost in just a few miles on Central. Oy. I was not happy. * I am proud to be part of a church that would give me the permission to be a Dad for special events like that. Thank you. * I was proud to be irrelevant to the church that night. Every text from study participants that said, "Go home, we're good," made me remember one of the most important lessons pastors, and leaders in general, can learn: it's not about us. Our main task is to grow leaders who will ultimately make us irrelevant. What a joy to see people embrace their own leadership and take pride in their own ministry. It's been a foundational understanding of ministry of mine since I was in seminary: pastors and professional staff should "equip the saints for ministry" (Ephesians 4:12). The best gift we can offer to layfolk is to help them realize their gifts, get out of the way, and let them use them for the Kingdom. 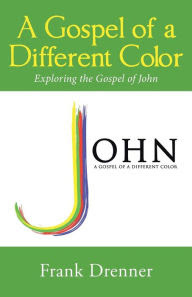 As John the Baptizer put it, "[Jesus] must increase, but I must decrease" (John 3:30). As we make this discipleship journey together, may you realize that you have gifts for ministry. Your pastors and professional staff can assist you in discovering your gifts, but it is not our responsibility to do the ministry of the church-- that's for the "saints,"-- YOU-- to use Ephesians' term. This is good news especially in United Methodist churches, where clergy serve at the pleasure of the bishop and agree to be appointed elsewhere when there is a need. Staff members sometimes move on for a variety of reasons. If we become too dependent on clergy, or professional staff, for ministry to happen, what do we do when they move on? Maybe you can help in this change of mindset-- the next time a pastor or staff person says, "I'll handle that," say, "No thanks. Just point me in the right direction and I'll handle it." Both of you will learn, or remember, a valuable lesson: it's ok to be irrelevant sometimes. It's ok to be sent home. It's ok to let someone do ministry when they assure you, "I've got this." The result will be increased faith, increased ministry, and increased pride in yourself and the church.